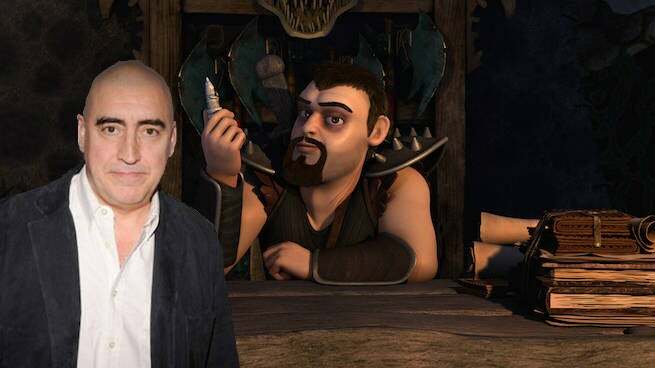 This week, Netflix will release new episodes of Dragons: Race to the Edge, which features Spider-Man 2 villain Alfred Molina as a new, power-hungry villain named Viggo Grimborn. He knows everything there is to know about dragons, clashes with Hiccup and the riders over the Dragon Eye. The big bad of the series' second season, Viggo is smart and calculating -- not unlike other villains Molina has played, like Doctor Octopus and Lex Luthor. Ahead of the show's premiere -- which takes place on Friday, January 8 on Netflix -- Molina joined ComicBook.com to discuss his role, his long career and what draws him to such nefarious characters all the time. You're stepping into this role as a villain. As a voice actor do you find that you're more likely to be cast as villains than in your live action appearances? Yeah. I've tended to play villains before, and I've never had a problem with that. I think that's what I'm kind of known for, but my feeling is playing villains has put two kids through college, so I have no complaints whatsoever about that. I think when you've been around a while actors get known for a certain thing, and I guess that's my bag. It's okay. It's a very nice thing to be associated with to be honest. I remember that when you played Diego Rivera, it was something like within three to six months of when Cradle Will Rock came out and Rubén Blades played Diego as well. At this point you've done Doctor Octopus and Lex Luthor and all these characters who appear in multiple projects. When you play characters that have other people doing them very soon after or shortly before or something like that, do you ever kind of watch that stuff and say, "That's an interesting take on this?" I would imagine that you have to invest a lot of yourself into any given role, and then to have somebody else doing it almost immediately is kind of odd. No. It's not really odd. It's just the way it goes sometimes. No actor has any kind of control, or no actor has any proprietaryl thing on a role. It's a bit like if an actor gets to play Hamlet and there's another actor playing Hamlet down the street at the same time. It's not like, "Oh, that's my part. You can't do it." I think every actor has a different way of approaching that role and the context is always different. The circumstances are different. When Rubén played Diego in Tim Robbins' movie, that was a very different take on the character than what we did in Frida. It was a different part of Diego's life, it was concentrating on a very specific moment in his life, whereas our movie was really about Frida and Diego was like a supporting character, in a sense, to her story. It was a very different take, so it didn't clash in any way, or there was no conflict of interest or anything like that. Going specifically into Dragons: Race to the Edge, you've played a lot of villains. The way that this one is described is as power hungry. That's a very general term, but do you think that in general that is a commonality in most of the villains that you play, is that power is a driving factor? Yeah. There's other qualities as well which are a bit more specific. Usually villains have a very specific agenda. They're usually hugely egotistical. They often have great intelligence and are often sociopathic in the sense that they have no real care or interest in how other people feel, and that's why, I suppose, we are fascinated by them because they exhibit characteristics that we find extraordinary, or scary, or a little bit so far out of our own experience that we're just sitting there slack jawed at what they're like. Viggo, for example, he's one of two brothers, as you know, and he and his brother are, in a sense, two sides of the same coin. Ryker is the muscle and he's the type of character that wants to just run in and start beating everybody up and killing everything. Viggo is more, "No. Let's just take a moment. Let's just look at the big picture." He's tactical. He's a tactician. He's also an inventor. He's also, I think, he enjoys his power. I think he enjoys it, and I think his agenda is just to carry on hunting dragons. He just loves what he does and he wants to get his hands on the ultimate thing which is the Dragon Eye, and that's what drives him. That's what motivates him. He becomes, rather than just a violent man, or a violent character, or just an angry character, he becomes a very thoughtful, very precise, almost like surgeon-like character. He has absolutely very specific goals and he goes after them in a very specific way. One thing that you said in that really stuck out to me is the idea that he has fun with it. That was something that for a while seemed to go out of fashion when villains were expected to be very gritty. I remember watching your Doctor Octopus and thinking that it was like this great, big, larger than life comic book depiction at a time when those weren't particularly fashionable but everybody fell in love with yours. Is it gratifying as it's circled back around to those sorts of characters being a little more common? The great trick in Spider Man 2 was the inhibitor chip which he loses, so he loses all his inhibitions. He loses all sense of what's right and what's wrong, and he just focuses on what he needs to do. That larger than life thing grew out of a very real situation, and I think that's why it was so satisfying, for audiences, because Doc Ock didn't exist just as a cartoonish character. He didn't suddenly just turn up with all the arms and start killing people and wreaking havoc. He grew into it, as it were, and we see the development. We were witnesses to his destiny, which kind of, I think, is what audiences really locked onto. Just as a quick aside -- it's very interesting to hear you analyze it that way, because there's a webseries called Really That Good, which looks at incredibly popular films and determines whether they hold up over time, and exactly what you said is the praise that somebody was placing on both you and the script in that series recently. So if that's what you were going for, that's exactly where you landed. Yeah. That's what we were all going for at the time, because these movies, there's a lot at stake in terms of making them successful and poplar and appealing to audiences, and so there's a great deal of thought goes into why and how and where and what. We spend months and months talking and developing and analyzing how best to make this work, and I think it was really Sam Raimi's dream to make the villain absolutely grounded, and have him ... I remember the very first day when we first met, he and I, to talk about doing it, and I still hadn't been cast. It was like an audition really. He said, "Do you have any questions?" I said, "Yeah. How do you see the villain? How do you see him?" He said, "I want him to be a good man who goes on an awful, terrible, terrifying journey." I kind of went, "Oh, yeah. That sounds great." It meant that the character was going to develop beautifully. It's all down to the writing in the end. I have to ask before I kick back to some questions about the show. If it came up would you ever consider going back? Everybody always talks about Simmons going back to that franchise, but yours behind his is probably the next person that all the comic fans are like, "Oh, yeah!" I think, maybe. I doubt if it will happen, because I think things move on. Yeah. Why not? If you're asking me would I be interested in doing Doc Ock again, I'd say yes. Absolutely. It's one of the great roles. Yeah. I can't see it happening personally. Moving back to Dragons. You were just talking about the responsibility that falls on you with these big properties that have an established fan base. Is the Netflix stuff a nice balance of that? This is a property that a lot of people care about and enjoyed, but the nature of these Netflix things seems to be that the productions themselves seem to be under a little bit less scrutiny than the average big budget feature film, because even though you're delivering high quality, big franchise entertainment, a lot of the time folks don't find out about it until months before? Yes. I think it feels very relaxed, I must say, but there again animation has a very, very long gestation period. It's a lot longer than, say, making a live action show. The animation takes a long time. The actors go in to record the voices, and then a few months later you go in to do it again because the animation has developed, has gone somewhere. Then you come back in and do rewrites and redo stuff you've done before. It's a slow process because it's so precise. It does feel relaxed. I think it certainly feels relaxed for actors, but I think probably behind the scenes there's a lot of hard work, a lot of late nights, a lot of very dedicated time to get all this stuff together. I don't think, for instance, my experience in terms of what my time taken was like is really representative of what was really going on. I pop in, do a couple of hours, then I'd come back a few months later and do another couple of hours. It was all very easy for me, but for the guys, for the men and women actually making the show, I think it's a very, very intense, high octane experience. We talked about a lot of your other roles. Going all the way back to the first time I saw you was in Raiders of the Lost Ark. You've played a lot of different kinds of antagonists, from the kind of weaselly guy to the power hungry Lex Luthor type. Do you have a particular favorite sort of villain? A favorite approach to these roles that really engages you? No. Not really. I don't really have a favorite kind. No. Not really. I think each one comes with its own qualities, its own challenges. I think, as I said before, it's really all down to how it's written. If the writing is good, if the story telling is good, then it's just fun to be part of it. It's a nice ... I find it a very comfortable niche to be in, to be honest. I enjoy playing villains, I must say. I really do enjoy it.